For Elphie, everything is an adventure. Is dad going to join Elphie on his quest or is the trip to the shop going to be dull and boring? Join Elphie and dad to find out! 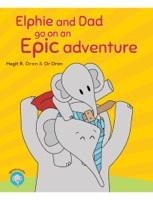 "Elphie and dad go on an epic adventure" is a fun beautifully illustrated book that addresses kids and parents alike. It shows how you can transform everyday mundane chores into exciting adventures.